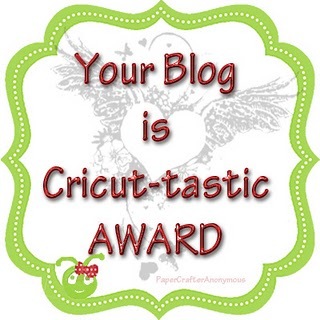 Thanks to Traci over at Cricutjunkie for this award, you should definitely go check out her blog...she's got some super talent! 1. I started out with a baby bug and when I upgraded I gave the baby to my mom. 4. I used the cricut to make the cutest basketball signs for my daughters school team. 5. My favorite cart right now is Create a Critter....now I just need to get those punny stamps to go with it! Ok..I know that's not 10 but that's all I have time for, and I really need to get back to work..It's been fun and I hope you all check out these ladies and their blogs, they do amazing work!! Congrats! Thanks for passing the award to me. I feel honored. I will post it soon. I also had the small on first and still haven't mastered the layers yet. Congrats....my dear friend !!! !You relly deserve it! !I´m very happy!! Hi sharla! I am so sorry That I have not Thanked you sooner For the awesome award!! I have not much time for getting all the things I want to get done,I have some free time today and going to get caught up...I hope!! Thanks again and have you been by lately? Have some more candy on a blog hop tomorrow!! Have a Great Sunday!! Thanks So Much! !